Here are fun things that people have ordered from my etsy store! [And you can order these things too! Links are below the picture.] I also do custom orders so if you can dream it, I can probably make it. Looks like this week I may be making a walrus monster! I am he as you are he as you are me and we are all together. Just to let you know, I probably won't be adding any already made monsters on etsy for awhile. 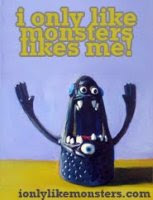 I'm trying to stock up on monsters and monster ornaments for the shows the weekend of Dec. 10th. So if you need stuff, find me! I'll be in Buffalo and Utica. And, as always, my stuff can be found at Thin Ice on Elmwood [Buffalo] and Arena's on East Ave. [Rochester]. Check the "WHERE TO BUY" tab up top for more info! Custom orders are also welcome. Email me for more info! You should do a skunk - Black and white is so "in" and a fluffy tail!! - contrasting with the rich red entrails! !